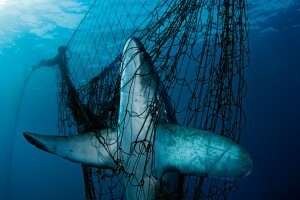 The two main factors posing a threat to shark populations are fisheries and the significant loss of habitat. In addition, sharks may be threatened indirectly by pollution, climate change, or infrastructural influences, such as the presence of underwater electric cables, but for now only the most prominent threats to shark populations will be addressed. Sharks have long been targeted in fisheries for their flesh (shark fins and skate wings), skin, liver oil, and cartilage. However, their long generation time makes sharks particularly vulnerable to fishing pressure. For many species, even light fishing pressure can result in steep declines in shark abundances. Scientists who reviewed fishing mortality and potential rebound rates for 62 shark species, estimates the average rebound rate to be only 4,9% per year, implying that not even 5% of a fished shark population recovers over a year. And this may even be worse for deep-sea species. Regardless of current observations that the Chinese market for shark flesh appears to be leveling out, the amount of shark fishing has not yet decreased on a global scale. Fortunately, the practice of finning sharks (cutting off their fins, and throwing back the remains of the live animal) is now restricted by many nations. Sharks are caught either in directed fisheries, where fishermen target them specifically, or as bycatch in fisheries targeting other species. Since directed fisheries for sharks do not occur in the Dutch Caribbean, the most significant source of fishing mortality arises from bycatch. For instance, longline fisheries often produce shark bycatch, since sharks are scavengers that will readily take bait that was placed for species such as tuna of swordfish. Also, nurse sharks are often accidentally caught in lobster trap fisheries on the Saba bank. In the wider Caribbean however, directed shark fisheries do still occur, posing a threat to all species moving throughout the region. Since directed fisheries for sharks do not occur in the Dutch Caribbean, the most significant source of fishing mortality is bycatch. Recent studies show that most sharks, including large, oceanic species likely depend on shallow coastal areas during part of their lifecycle. This makes many of them vulnerable to habitat destruction in coastal areas, as caused by man and possibly, on the long-term by climate change. Several shark species, such as bull shark, or lemon shark, are also quite dependent on estuarine habitat, which are often under extreme development and anthropogenic pollution pressure. The dependence of sharks on habitat quality has been very little studied so far. One particular dimension of habitat quality that is hardly studied is that of food availability. Sharks are potentially affected by a shortage of prey due to competition for the same resources by their largest fish eating competitor, namely man, but this has been studied even less.